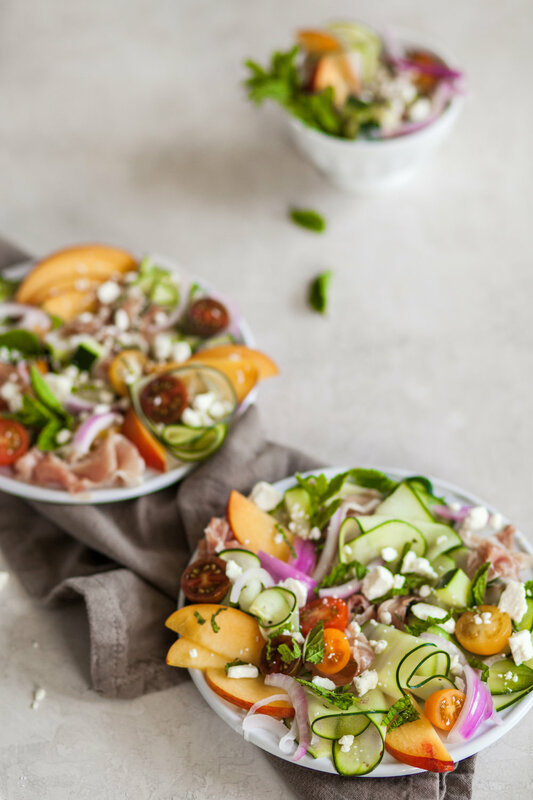 cucumber, peach & prosciutto summer salad. it's the cantaloupe + prosciutto combo for people who don't actually really like cantaloupe. hey, we want that delightful juicy summer fruit + thin, salty, chewy meat flavor profile, too!! enter the yellow peach. plus thin lightly marinated cucumber ribbons and a bunch of other tasty morsels atop. this little summer salad is so so freshhhh, crisp, juicy and so flavorful. sometimes when it's hot out you just want something cold and crunchy and easyyyyyy. but you demand flavor as well! this comes together in under 15 minutes and satisfies all of those thangs! my personal food critic peter really really enjoyed it too. this is key. you quickly marinate your cucumber ribbons in a bit of white vinegar, pinches of salt, pepper & red chili flakes. while that's chilling in the fridge, slice and blanch your red onions. slice the peach and gather the rest of the ingredients. 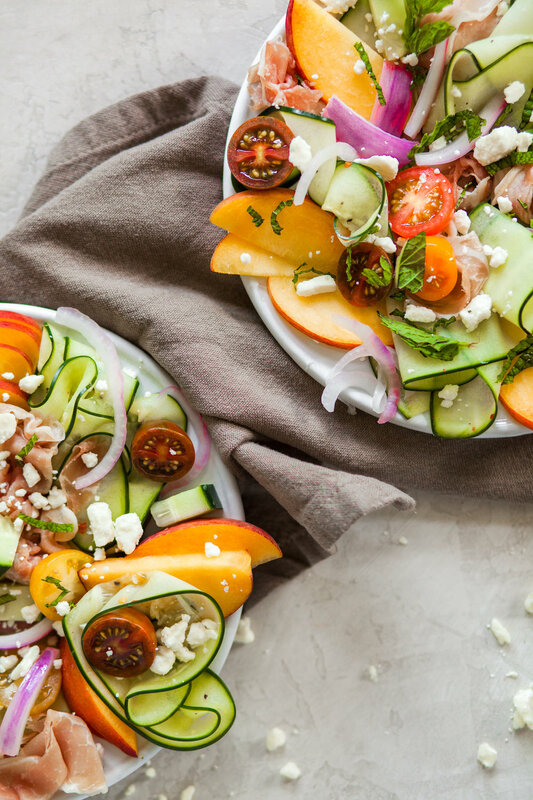 build the salad with the cold cucumbers, peach slices, prosciutto, red onion, cherry tomatoes, feta crumbles and torn fresh mint! sorry bout it, cantaloupe. peach + prosciutto just does it betta. Slice the cucumber long-ways into very thin ribbons. I recommend using a mandoline to make them consistent and very thin (be careful not to cut your fingers!!). Place the ribbons in a bowl and add the white vinegar with a pinch of salt, black pepper and red chili flakes. Toss and refrigerate while you prepare the rest of the ingredients. Heat several cups of hot water to boil. Slice the red onion and add to a strainer and set in the sink. Pour the boiling water over the onions to blanch. Rinse with cold water and drain. Slice the peach and tomatoes. Remove chilled and lightly marinated cucumber ribbons from the fridge and begin assembling the salad using the cucumbers as the base. Add sliced peaches, torn prosciutto, blanched red onion slices, cherry tomatoes, feta crumbles and fresh mint.